Here’s a list of (mostly) recently-published books that would make fine gifts for the young readers in your life. 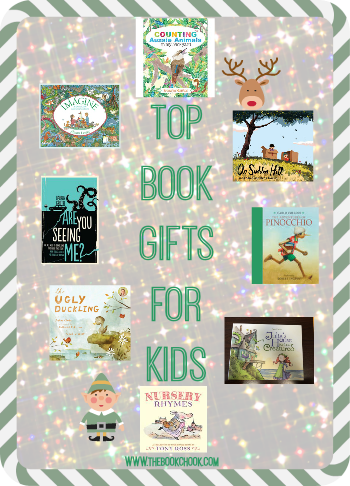 Below you’ll find books for babies through to young adults, puzzle books, chapter books, classics, award-winners, funny books, graphic picture books, Christmas-themed books - the whole gamut of reading material! In the interests of keeping the list manageable, I had to leave out hundreds of other excellent books. Locate many more book gift ideas by clicking on Reviews. Axel Scheffler’s Flip Flap Safari: Children who aren’t developmentally or temperamentally ready to read story books can be tricky to buy for. This is where puzzle and toy books come into their own. They help kids associate books with enjoyment, and may well be a step along their pathway to reading. Flip Flap Safari is a sturdy hardback created by Axel Scheffler, and published by Nosy Crow (Allen and Unwin in Australia.) RRP: $AU15.99. It encourages kids to create. By turning the flaps, children visually create all sorts of weird and wonderful creatures, and they can then listen to someone read the resulting rhyming verses and see the creature’s vocalisation too. NB Nosy Crow also have an app to match! This may well inspire your youngsters to go on and create their own lift-the-flap books! Duck by Janet A. Holmes and Jonathan Bentley, published by Little Hare/Hardie Grant Egmont, 2009. Here’s a lovely gift suggestion for a toddler. It’s a robust board book. So what, I hear you say, there are heaps of board books. Ah, but this one is a truly gorgeous story too. I defy anyone to read it aloud without swallowing a lump in the throat! A little boy, complete with baggy pants and a red hero cape, introduces us to Duck, who thinks this boy is the greatest. We see what an integral part of the boy’s life Duck is, and feel his pain when Duck goes missing. Any child, including the child inside each adult, will understand, and heave a huge sigh of relief at the happy ending. Nursery Rhymes by Tony Ross, published by Anderson Press (Random House Australia.) Are you buying for a baby? I have lots of suggestions in Beautiful Books for Babies, and here’s another. This is a set of four board books, perfectly sized for little hands, and gorgeously illustrated by Tony Ross. Inside Action Rhymes, Animal Rhymes, Bedtime Rhymes and Playtime Rhymes you’ll find perennial favourites like This Little Piggy, Old Mother Hubbard, Jack and Jill and Twinkle Twinkle Little Star. Reading, chanting and singing rhymes with kids helps them develop literacy skills, so give your babe a flying start! Counting Aussie Animals in my Backyard by Bronwyn Houston, published by Magabala, 2014. Counting books are wonderful for the very young. I love that this is a book with Aussie animals to count, but I ADORE that Counting Aussie Animals in my Backyard is so sumptuously and vibrantly illustrated! Houston uses pattern and jewel-like colours to make stunning digital collages where, for example, “Seven dragonflies dart across the garden.” If you’d like your children to be able to connect with the sorts of animals they might see in their own backyards, then this one is for them. One Night by Penny Matthews and Stephen Michael King, published by Omnibus Books. RRP: $AU24.99. Every bookish list at this time of year needs a Christmas-themed book. One Night is a delightful children’s picture book based on the folk tradition that the farm animals who witnessed Jesus’ birth were given the gift of speech. Matthews reveals what the animals say, each sharing what they contributed that night. She does this with occasional touches of humour, as when the cat tells us he lay at the Baby’s feet to adore him - for a little while, at least! King’s watercolour and pencil sketches are gentle and charming, adding a subtle subtext to the story. Teachers will enjoy the Teacher Notes provided at the Scholastic website. On Sudden Hill by Linda Sarah and Benji Davies, published by Simon and Schuster, 2014. It’s such fun to pair a carefully chosen toy with a book, isn’t it? Since On Sudden Hill is a celebration of the cardboard box and what it offers kids, why not find varying sizes of cardboard cartons, nesting them inside each other, and pop this book isn’t the smallest one. It will make even the gift opening a memorable experience and your youngster will have ready made building materials close to hand, should they be inspired by this charming children’s picture book. Here’s my earlier review. Any Book Gift list needs at least one LEGO book! My pick this year is LEGO Ninjago: The Visual Dictionary, published by Dorling Kindersley (Penguin.) RRP:$AU29.99. I love the Dorling Kindersley books, mostly because I’ve seen the way kids respond to them. They are immensely appealing visually, and use children’s interest in LEGO to lead them into reading. The icing on this bookish cake is that The Visual Dictionary contains not just Ninjago heroes, enemies and weapons, but also a mini-fig for kids to collect. If you know a reader who hasn’t yet discovered his reading mojo, but loves LEGO, can I suggest that reading this with a parent might help him enjoy reading and books more? Imagine 25th Anniversary edition by Alison Lester, published by Allen and Unwin, 2014. I promised you classics in my introduction and I believe this book is a modern Australian classic. Written and illustrated by one of my favourite Australian authors, Alison Lester, this is a special large format 25th Anniversary Edition of Imagine, complete with sparkly cover. RRP:$AU24.99. I hesitate to say every home should have this book, for who am I to say what you must do? But I sincerely urge you to find a copy of the book. I’m sure you’ll be instantly persuaded you need it. Why? It encourages kids to imagine themselves in different environments, using vocabulary perfectly calculated to evoke an atmosphere. We see kids at play, imagining themselves in the jungle, under the sea etc. Then we see Lester’s detailed depiction of the jungle, the ocean etc. It also works as a puzzle book, with each alternate double page spread surrounded by words for children to find the corresponding images. I love that there’s a key at the end to help story-sharers like me actually identify the animals! I Wish I Had a Pet by Maggie Rudy, published by Beach Lane Books/Simon and Schuster, 2014. Sometimes a loving relative will ask parents for a book gift suggestion. At such times, I think it’s great if we can suggest a book that relatives and friends will enjoy reading to little ones. Every adult and child will appreciate I Wish I Had a Pet! It’s the sort of book I see Grandma and kids reading while cuddled up on the sofa, poring over the illustrations. Each spread has been hand made by Maggie Rudy with incredible loving attention to detail. The story is a sweet and simple one about a little mouse who wants a pet but needs to learn about all that’s involved in pet ownership. The Fantastic Flying Books of Mr Morris Lessmore by W.E.Joyce and Joe Bluhm, and published by Simon and Schuster, 2012. Here’s one for a child who is bookish or simply loves to read and let her imagination soar. It also makes a great gift for an adult who understands the power of books and literature to change lives, especially a librarian. It’s an important book, one everyone should read. It’s also an app and an Academy Award-winning short film. The illustrations use both a sombre palette and a colourful one to highlight different parts of the story. My favourite quote: ‘“Everyone’s story matters,” said Morris’. Indeed! Julia’s House for Lost Creatures by Ben Hatke, published by First Second, 2014. Girls need feisty heroines, and will find one for sure in Julia. She sets up a sign outside her home, announcing it’s a House for Lost Creatures. She welcomes the strange assortment of bizarre trolls, goblins, dragons etc until she realises there is a desperate need for house rules. The watercolour art work in this charming picture book/comic hybrid owes much to Hatke’s background in comics, and has oceans of child appeal. The Ugly Duckling: This version of the classic Hans Christian Anderson tale is performed by Justine Clarke, illustrated by Nathaniel Eckstrom, was written by Frank Loesser and published by Scholastic Australia, 2014. RRP: $AU24.99. Instruments like the marimba, tuba and the trumpet complement Justine’s beautiful voice. Eckstrom’s illustrations, created with digital pencil and oil painting on canvas, have a lovely warmth and retro feel to them. Books accompanied by CDs offer much to beginning readers. By listening and reading along, children begin to memorise a book, an important step along the road to reading. Grandparents may know the original version sung by Danny Kaye, and will enjoy the fact that there’s also an instrumental version that kids can sing solo with. Peanuts Guide to Life: A series of four beautifully bound small hardcover gift books, comprising The Philosophy of Snoopy, The Genius of Charlie Brown, The Wisdom of Woodstock and Life Lessons from Lucy. Created by Charles M. Schultz and published by A and U Canongate, 2014. RRP: $AU 14.99 each book. Sometimes you want a book gift for a child that grown-ups will resonate with too. Peanuts is a cartoon that has been charming readers since 1950. I love the idea of kids, parents and grandparents sharing these books. I know older generations will relish being able to introduce youngsters to the characters they loved. These also make great books for a library- the sort that fly off the shelves! My favourite? I just adore Woodstock, especially the way Schultz has Snoopy interpret for him. Where's Wally? The Totally Essential Travel Collection: Every list of book gift suggestions needs a puzzle book. Where’s Wally? is a great visual puzzle that appeals to all ages, including adults. Created by Martin Handford and published by Walker Books, this edition is all seven classic Where’s Wally? books in a robust travel collection, including six postcards. Perfect for the car, the plane or just for fun. Have you ever been kissed by a dog? Ever had to eat Vegemite off your sister's big toe? Have you had a job delivering teeth? Has a bloodthirsty magpie ever been out to get you? Ever woken up to discover that everything hovers? And have you eaten 67 hot dogs in ten minutes? I have. I'm Tom Weekly. This book is full of my stories, jokes, cartoon characters, ideas for theme park rides and other stuff I've made up. It's where I pour out whatever's inside my head. It gets a bit weird sometimes but that's how I roll. Bancks knows what will make young readers laugh, and want more. Gus Gordon’s cartoon-like sketches, lists, random jottings, text boxes, and other interjections add to the humour. I recommend these chapter books particularly for boys who are not yet sure they love to read. But I bet any youngster will relate to Tom’s misadventures. The Adventures of Pinocchio by Carlo Collodi and illustrated by Robert Ingpen, published by Walker Books, 2014. Fairy tales are important. Most kids don’t find them too dark, though each parent must of course judge for him/herself. If you want your children to have access to the classics, then this version of Pinocchio will appeal. Originally a weekly serial in an Italian children’s magazine, the book form of The Adventures of Pinocchio first appeared in 1883. At more than 200 pages and 36 chapters, this unabridged edition is for excellent readers who will be beguiled by Collodi’s exuberant story and charmed by Robert Ingpen’s soft-focussed, beautiful illustrations. It’s rare to find such a gem, nicely bound, and with matte pages - an excellent choice for libraries too! Are You Seeing Me? by Darren Groth, published by Woolshed Press, 2014, an imprint of Random House Australia. I read about Are You Seeing Me? in Sue Warren’s review at Just So Stories. Instantly I knew this was a book to seek out. Justine and Perry are nineteen-year-old twins, with Justine sole carer of her disabled brother, Perry. The two set off on a holiday to Canada, where Perry wants to celebrate some of his favourite things: mythical sea creatures, Jackie Chan movies and seismology. There are all sorts of tensions and conflicts ahead, not least of which is meeting the mother who abandoned them. If you are buying for teens who enjoy books about real-life situations, point-of-view characters so real you want them as friends, and lots of drama and humour, I recommend Are You Seeing Me?. I think it’s important for young people to have access to excellent writing - perhaps they won’t notice it, but it inevitably makes a book memorable and enjoyable. I suspect adults who (like me) enjoyed The Curious Incident of the Dog in the Nighttime by Mark Haddon, The Rosie Project by Graeme Simsion or Lottery by Patricia Wood will love it too. With Christmas looming, and gift-buying on many people’s minds, I hope the above list will give you ideas for the young readers and readers-to-be in your lives! A book gift from you may very well be a much-prized step in a child’s journey to a lifetime love of reading. Thank you kindly for including the MY LIFE books in your gift recommendations for the year. I am chuffed. You are a wonderful advocate for Australian children's authors and illustrators and your blog and social media presence is a fantastic thing for children's lit. Thank YOU, Tristan, for encouraging children to be lifelong readers. Humour, well-done and authentic, is a great lure for kids who have not yet embraced reading. Your books delight us and make us laugh! Very kind words. Keep fighting the good fight. And let me know if I can be useful to you. One day we must get together, and recommend still more great books to each other. Bad luck to anyone else who wants to get a word in edgewise! Would love to listen in on that conversation. Perhaps you could do a blog duet? Or speak to Al Tait and Valerie Khoo on the podcast? Or start your own? #onenightonly ?